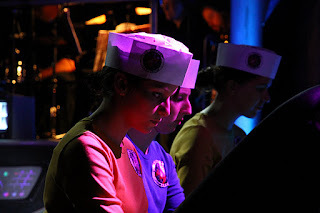 Return to the Forbidden Planet is a fun-filled rock musical with a live band right on stage! The basic story is The Tempest, but re-set in a 1950's/60's sci-fi movie, where a space-ship and its crew crash land on an unknown planet, to find a misguided scientist and his daughter have been living in exile. Lighting and Set-wise, this is probably the most ambitious project that YAT have ever undertaken! 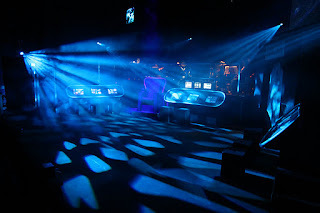 The stage had to become the bridge of a space-ship, complete with control panels, airlock, view-screen, Klystron Generator and a live band! 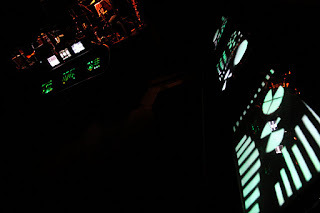 The Control Panels were on of the biggest jobs. 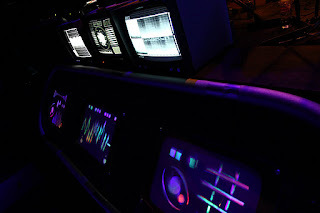 My original design involved sticking all sorts of buttons, knobs and other junk onto panels in various patterns and arrangements to look as though it made sense when the actors interacted with them. However, this was both time-consuming, and was in danger of looking "naff" (thank you Kath, my old A-level Art & Design teacher, I will forever use that word!) if we didn't find enough of the right stuff. So what we ended up doing was cutting shapes out of pieces of cardboard which would go behind panels with three rectangular holes cut in each. In between there would be a sheet of tracing paper to diffuse the light, and on top a rectangular piece of acrylic. Underneath, christmas-tree lights were positioned and set to a slow random phase, making it look as though something was happening. And there we are - we had nine touchscreens! Very fancy. They looked really effective, and really tied in with the lighting too and the minimalism of the rest of the set. I also designed and made the Ariel (robot) costume for Asha pretty much from scratch. My original drawings were based on the robot from Metropolis, and you may see a slight resemblance in the final costume (see top). I made silver shaped panels out of a shiny silver fabric which was surprisingly cheap, and I sewed them onto a black polo-neck top and a pair of black leggings. Then, to cover up the red and blue roller skates, I cut the bottom off a pair of wellies that a cast member luckily happened to not want any more, spray painted them silver, and the size 8 wellies just happened to fit perfectly over the size 5 roller skates! Would you believe it? 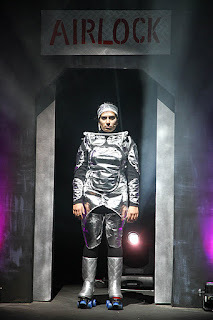 I also created a pipe-work structure to attach to the shoulders and head - you can just see it in this photo, but this ended up being too cumbersome on the dress rehearsal night, so for the opening night I made a fitted silver cap that worked really well. YAT (or Youth Action Theatre) are a free theatre group for young people aged 16-25 based in Teddington, Surrey. Click here to find out more about past and future productions and how to join!